Authors: Frank S. Alexander, John Witte, John Witte Jr.
Protestant, and Orthodox thought to current debates about the family, state, religion, and society. Essays consider the ideas, influences, and intellectual and cultural contexts of a variety of figures, including Jacques Maritain, Gustavo Gutiirrez, Dorothy Day, Pope John Paul II, Susan B. Anthony, Karl Barth, Dietrich Bonhoeffer, Reinhold Niebuhr, Martin Luther King Jr., Nikolai Berdyaev, and Vladimir Lossky. The contributors illuminate these thinkers' views on issues that continue to affect modern pluralistic societies, including the nature and purpose of law and authority, the limits of rule and obedience, the care and nurture of the needy and innocent, the rights and wrongs of war and violence, and the separation of church and state. The historical focus and ecumenical breadth of this collection fills an important scholarly gap and revives the role of Christian social thought in legal and political theory. 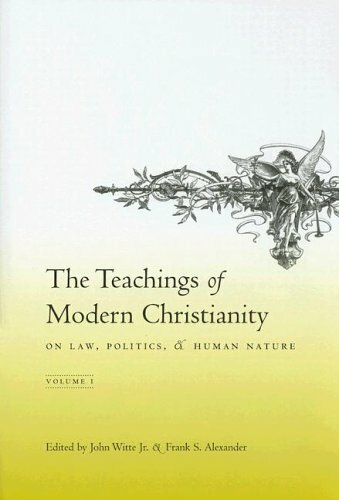 The second volume of "The Teachings of Modern Christianity on Law Politics, and HumanNature" is an annotated reader of works by the figures discussed in this volume. John Witte Jr. is the Jonas Robitscher Professor of Law and co-director of the Center for the Study of Law and Religion at Emory University. He has published numerous volumes, including Law and Protestantism: The Legal Teachings of the Lutheran Reformation.Frank S. Alexander is interim dean and professor at the Emory School of Law. He is the founder and co-director of the Center for the Study of Law and Religion at Emory University.